Cisco is introducing a "Quantum" product suite that integrates network analytics, policy control, Self-Optimizing Network (SON), and WAN orchestration capabilities to give network operators better tools for monetizing traffic. Cisco said its goal is to identify data-in-motion revenue opportunities via a monitoring abstraction layer and then apply real-time or near real-time policy control via PCRF to ensure better subscriber services. 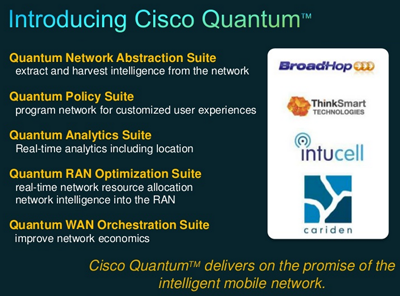 The wide range of technologies brought together in Cisco Quantum originate both in-house and through a number of acquisitions carried out by Cisco in recent months, including BroadHop (policy control), Intucell (Self-Organizing Networks), ThinkSmart Technologies (location data analysis using Wi-Fi), and Cariden (network planning, design and traffic management). Cisco is looking to extend its considerable reach in campus and enterprise Wi-Fi by introducing licensed radio small-cell carrier capabilities. 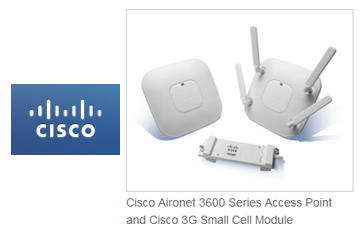 Cisco 3G Small Cell Module for Cisco Aironet Access Points is Wi-Fi compatible and integrates licensed and unlicensed small cells with a plug-in 3G radio for ease of deployment. Cisco said the upgrade slot on its latest Aironet APs could accommodate 4G radio plug-in, although this has not been announced so far. The 3G plug-in does not require a separate antenna as it uses the AP's antenna. Cisco 3G Small Cell expands Cisco’s solution for enterprises with a channel to market for premises-based deployments. A highly publicized report from Mandiant, a security consulting firm based in Arlington, Virginia, links cyber attacks on over 140 U.S. corporations to a specific unit of China's People's Liberation Army. The report, called "APT1: Exposing One of China’s Cyber Espionage Units," details how it has the PLA's Unit 61398 systematically carried out spear-phishing attacks and stole confidential data from leading companies across multiple industries. Mandiant claims the widespread attacks are on-going. In addition to describing the methodology of the attacks, the Mandiant report provides domain names, MD5 hashes of malware and X.509 encryption certificates associated with the attackers. APT1 is believed to have dozens, if not hundreds of human operators. APT1 maintains an extensive infrastructure of computer systems around the world. 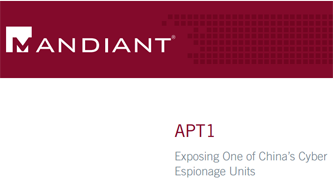 In over 97% of the 1,905 times Mandiant observed APT1 intruders connecting to their attack infrastructure, APT1 used IP addresses registered in Shanghai and systems set to use the Simplified Chinese language. registered to organizations in China (709), followed by the U.S. (109). Nokia Siemens Networks is introducing new Micro and Pico base stations for LTE and Wi-Fi designed to complement standard base station capacity in hot zones - areas of high subscriber density. The new Micro and Pico bases stations can be integrated into the company’s Flexi Zone architecture for mobile traffic hot zones. Nokia Siemens Networks’ Flexi Zone supports up to 100 access points per hot zone while operating as a single base station from the network’s point of view. 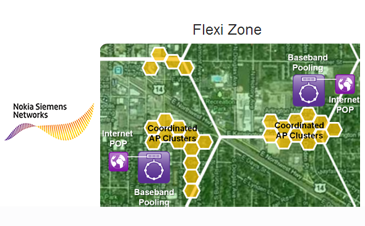 NSN said the unique architecture of Flexi Zone helps manage interference and significantly reduces the core network and maintenance demands of large small cell deployments while addressing street level challenges. The compact next generation Flexi Zone Micro and Pico can be operated as stand-alone base stations initially and then evolved into Flexi Zone Access Points in a Flexi Zone architecture, as hot spots grow into hot zones from areas covering a few cells to large indoor spaces like shopping malls and airports. At next week's Mobile World Congress, NSN is also introducing new HSPA+ and LTE Femtocells for small cell coverage in enterprises and indoor public areas. The two new products feature plug-and-play deployment and provisioning to enable rapid ramp-up of new services, tap into new revenue streams, and capitalize on value-added enterprise services. The FAPe-hsp 5620 Femtocell for HSPA+ offers high output power for large coverage, while the FAPe-lte 7610 is the company’s first Femtocell Access Point for LTE. The company is also enhancing services for Heterogeneous Networks (HetNets) to include customer experience management capabilities to analyze traffic hotspots and ensure backhaul capacity. Services for HetNets includes hotspot analysis, optimization and small cell planning and deployment to help operators optimize their mix of macro and small cells. 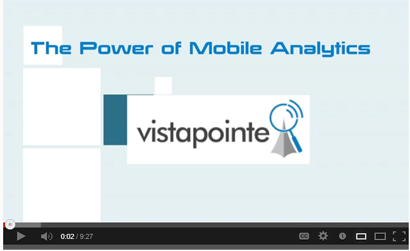 It now provides customer experience management capabilities to help operators understand the effect of traffic hotspots on the end user experience. LSI introduced its ARM-based family of Axxia 5500 processors designed for multi-radio LTE base stations, cell site routers, gateways and mobile backhaul equipment. The new processors combine up to 16 ARM Cortex-A15 cores with LSI specialized networking accelerators to optimize performance and power efficiency. On-chip network accelerators deliver up to 50 Gbps packet processing, 20 Gbps security processing and 160 Gbps of Ethernet switching via 16 10G Ethernet interfaces. LSI plans to offer several versions with different core counts and throughput capabilities. 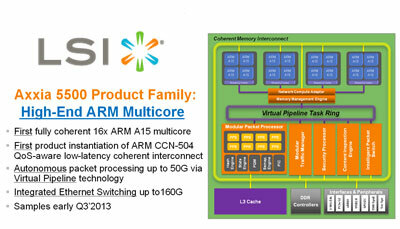 The chip design leverages ARM’s CoreLink CCN-504 low-latency interconnect in 28nm process technology. LSI said its combination of networking expertise, specialized acceleration engines and Virtual Pipeline technology with ARM’s power-efficient processors and interconnect IP delivers communication processors that are uniquely suited for building intelligent, heterogeneous networks. Tilera introduced a processor packing 72 power-efficient cores, 100 Gbps I/O and four high-performance DDR3 memory controllers. The design targets Big Data appliances, such as L2-7 networking and firewall platforms and high-throughput SDN equipment. 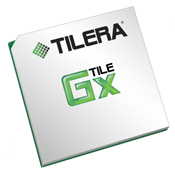 The TILE-Gx72 leverages Tilera’s iMesh-dimensional interconnect, DDC distributed coherent cache, and TileDirect direct-to-cache I/O. The new design doubles the performance of the company's TILE-Gx36 processor introduced a year ago. Tilera said its silicon will be capable of performing network monitoring and analytics with 100% line-rate packet capture at 100 Gbps. Martin Cooper, who led the Motorola team that developed the first mobile phone in 1973, was named as one of the recipients of the Charles Stark Draper Prize, the highest honor of the National Academy of Engineering. Cooper famously placed the first portable, cellular call on April 3, 1973 from outside a press conference in New York City to a landline at Bell Labs in New Jersey. The call used the Motorola DynaTAC, which weighed 2.2 lbs., had 35 minutes of talk-time and a battery life of 20 minutes. "Long before we messaged people in real-time, had instant maps for anywhere, or streamed movies on our smartphones, Martin Cooper and his team laid the foundations of mobile phone technology," said Iqbal Arshad, SVP, Global Product Development, Motorola Mobility. "When we look at everything that's been accomplished thanks to the hard work of Martin and his team, we can't think of anyone more deserving of this honor." Other recipients of the Charles Stark Draper prize this year include Joel S. Engel, Richard H. Frenkiel, Thomas Haug, and Yoshihisa Okumura, all of who were recognized for their contributions to communications. NTT DOCOMO has surpassed the 10 million subscriber milestone for its Xi (pronounced crossy) LTE mobile service. Subscribers reached one million in December 2011 and then quickly topped five million in August 2012. 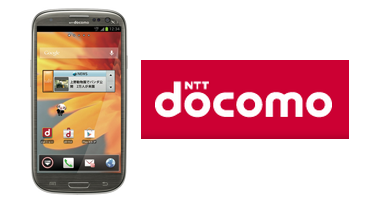 NTT DOCOMO commercially launched its LTE service on December 24, 2010. DOCOMO supports its LTE customers with a wide variety of advanced devices, including 32 smartphones, six tablets and seven data terminals so far. DOCOMO currently has also 4,000 base stations supporting at least 75 Mbps downlinks. This number is expected to jump to 10,000 by June. The company also plans to introduce a 150 Mbps downlink service before March 2014. Cavium introduced TurboDPI II software for its OCTEON II processors. The software includes up to nine major DPI functional modules. 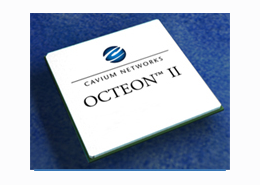 Cavium's design ensures that data is only scanned once by the OCTEON's built-in hardware HFA DPI engines, and then the results are passed to the appropriate module. The company said its TurboDPI II enables market-leading DPI performance and speeds up time to market for Enterprise Cloud, Data Center and 3G/4G/LTE Wireless equipment manufacturers. 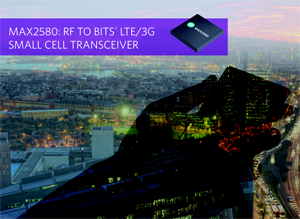 Maxim Integrated and Freescale Semiconductor are planning to to showcase an LTE/3G picocell base station at next week's 2013 Mobile World Congress. The picocell base station design integrates a Freescale BSC9132 multi-core baseband processor and Maxim MAX2580 small cell RF transceiver to deliver LTE/3G coverage with 1W+ antenna output. The LTE/3G picocell brings together a Freescale BSC9132 base station SoC card, a Maxim MAX2580 RF transceiver card, RF power amplifiers, and network management cards—all in a passively cooled enclosure and weighing in at 6.8kg. Nokia Siemens Networks named Samih Elhage as its chief financial officer. Elhage, who was previously the company’s chief operating officer, will continue to report to CEO Rajeev Suri as a member of the company’s Executive Board. Elhage replaces Marco Schroeter, who leaves Nokia Siemens Networks with immediate effect. Before joining Nokia Siemens Networks in March 2012, Elhage served as a senior advisor to leading private equity and global management consulting firms. Prior to these advisory positions, until August 2010, Elhage held a number of leadership roles at Nortel, including president of Carrier Voice over IP and Applications Solutions, and vice president of Corporate Business Operations.